Location: Liechtenstein is a country in Central Europe. It is landlocked (doesn’t have a coastline) and is bordered by Switzerland and Austria. Liechtenstein is the only country to exist entirely in the Alps mountain range. The largest town in the country is Schaan. The first factory in Liechtenstein was opened in 1836. It made ceramics. 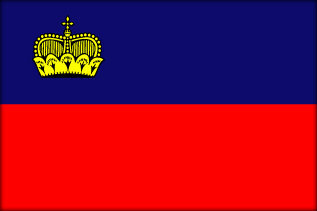 Liechtenstein was neutral during World War 2, following the lead of its neighbour, Switzerland. Women were given the right to vote in 1984. The River Rhine forms the border between Liechtenstein and Switzerland. Liechtenstein is the smallest country to win an Olympic medal. In 1980, at the Winter Olympic Games, Hanni Wenzel won two gold medals and one silver medal. Liechtenstein doesn’t have a military. The army was disbanded in 1868. The Prince of Liechtenstein lives in Vaduz Castle. There are less than 30 policemen in all of Liechtenstein. The national anthem of Liechtenstein is called Up on the Young Rhine. The country’s national day is on 15th August.